Almost 50 years after President John F. Kennedy was shot and killed, visitors at the preview event of Philadelphia University’s striking new exhibition, “Single Bullet: Arlen Specter & The Warren Commission Investigation of the JFK Assassination,” were transported back in time to the scene of the assassination on Nov. 22, 1963. For many visitors, a highlight of the exhibit was a full-scale model of the 1961 Lincoln limousine President Kennedy was riding in when he was hit by two bullets during a presidential motorcade through Dealey Plaza in Dallas. When sitting in the rear seat of the model, where Kennedy was sitting at the time of the assassination, visitors can observe from computer monitors built into the model where the bullets struck the president and the view from other key vantage points, including from the Texas Book Depository window where Oswald was perched when he fired the shots. About 200 PhilaU faculty, staff and students and visitors attended the preview of “Single Bullet,” the inaugural exhibit of The Arlen Specter Center for Public Policy at Philadelphia University. The exhibit features the collaborative work of architecture, graphic design and law and society students and faculty members, and staff of the Specter Center. Howard P. Willens, right, spoke about the Warren Commission’s findings. Almost 50 years later, he unequivocally defends the Commission’s finding that Oswald was the lone shooter responsible for Kennedy’s assassination. “I have no reservation whatsoever in reaffirming on a daily basis the conclusion of the Warren Commission,” said Willens, who spoke to an overflowing room during an interview moderated by Evan Laine, director of the law and society program. Joan Specter, the widow of Sen. Arlen Specter, said at the event, “I think it’s amazing. It really shows how that single bullet could have happened,” referring to the conclusion of Specter and the Commission that one single bullet hit both Kennedy and then-Texas Gov. John Connally, who was sitting in front of the president. Many of those who lived through the events of that day remember it clearly—and emotionally. For many of today’s college students, however, it is an historical event from a long-gone time. 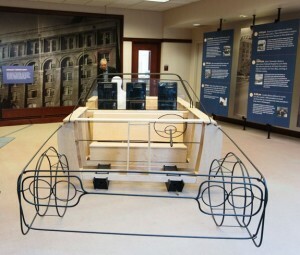 The full-scale model of the 1961 Lincoln limousine was constructed by PhilaU students. Frank Baseman, program director and associate professor of graphic design communication, said the project was a lesson in history for PhilaU students. “They needed to become mini-experts about the JFK assassination and Specter’s role on the Warren Commission, so they had to do research,” he said. Visitors check out part of the “Single Bullet” exhibit. That sense of reality was the purpose of the exhibit’s design, said associate professor of architecture David Kratzer, who worked on the project with his students. “The idea was to put the visitor in the place of Arlen Specter and in the place of JFK,” he said. Senior architecture student Corey Pedersen created the manikin showing where one of the bullets hit Connally, who was riding in front of Kennedy and was wounded during the assassination. For many visitors, the manikin helps brings the scene to life, showing clearly how one bullet could have traveled through the president’s neck and struck Connally in several places. “The most incredible part of this experience is the fact that you get to go back and look at history and be a part of it, because this experience is so immersive,” Pedersen said. The exhibit, which officially opens Oct. 21 and runs through April 11, 2014, was supported with a $100,000 grant from PNC Foundation. The exhibition is open to the public weekdays from 9 a.m. to 5 p.m. 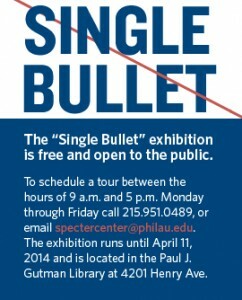 Individual and group tours can be scheduled by emailing spectercenter@philau.edu. Arlen Specter passed away in 2012 after representing the Commonwealth for 30 years as its longest-serving U.S. Senator and one of the most influential of his time. 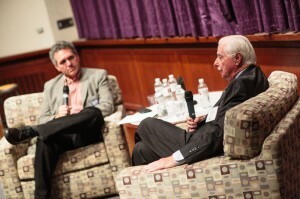 In December 2010, he donated his extensive archive, encompassing 50 years of public service, to Philadelphia University to establish The Arlen Specter Center for Public Policy. The Center’s mission is to foster greater understanding of political science, government and history through research, educational programming and exhibitions inspired by Specter’s career as reflected in his extensive archive. The Specter Center will be housed in the historic Roxboro House at Philadelphia University, which is currently undergoing renovations. To view more photos from the preview of “Single Bullet”, click here.